You can get caught up discussing student loans and other ways to pay for tuition and room and board, but don't forget to talk about day-to-day finances. First-year students have a lot on their minds as they begin college—class schedules, dorm room décor, cafeteria food—but they should also keep managing personal finances top of mind. Handling discretionary income is a critically important life skill. It can even intimidate adults. But if college students can learn some discipline now, they'll be much more prepared for the "real world" after college. Look for a job. A part-time job while at college can provide a little spending money. Plus, having an extra responsibility on top of academic work can help your student manage his or her time better—another great life skill. Choose cash. Suggest your child make everyday purchases with cash instead of credit or debit cards. Many studies, including one by MIT,* have shown that people spend less when they carry cash instead of plastic. Plus, cash provides an easy way to budget—when it's gone, it's gone. But also establish credit. While students shouldn't overuse their credit cards, they should have some credit history by the time they've graduated. (It helps them when they're looking for a car, job, or first place to live.) Consider cosigning for your child's credit card to help build credit in his or her name. The card could be used for emergencies or purchases made with your blessing. Watch out for fees. Credit and debit cards can be convenient, but fees (think overdraft and ATM fees) can load you down. 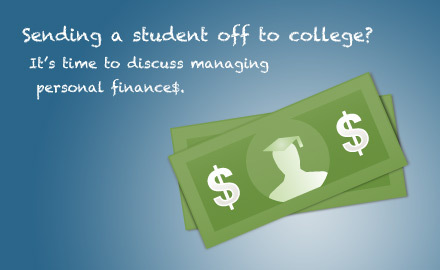 So, make sure your student keeps track of all potential fees associated with any accounts. Before your kids begin their college careers—and gain a whole lot of experience through their newfound independence—make sure you've chatted with them about personal finances too. They may even thank you...one day.